SHEBA LODGE is located at 28 CARPMAEL ROAD in district 15 (Katong, Siglap, Tanjong Rhu) of Singapore. SHEBA LODGE is a Freehold Condo development. SHEBA LODGE is completed / TOP in 2002 (estimated). 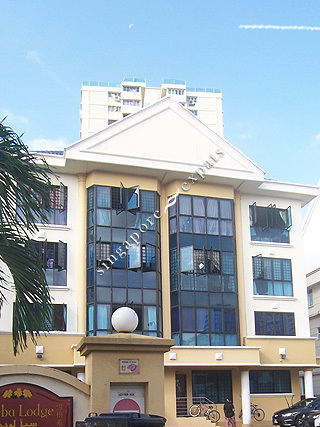 Educational institutions like CANADIAN INTERNATIONAL SCHOOL (TANJONG KATONG), CHATSWORTH INTERNATIONAL SCHOOL (EAST), ETONHOUSE INTERNATIONAL SCHOOL, HAIG GIRLS' SCHOOL, TANJONG KATONG PRIMARY SCHOOL and KONG HWA SCHOOL are near to SHEBA LODGE. SHEBA LODGE is accessible via nearby PAYA LEBAR, EUNOS and DAKOTA MRT Stations. Cosy small development, hidden away from busy road yet conveniently locate within walking distance to MRT, eateries, food court, shopping malls.